Chieftainess Mumbi Mukulu is in Lusaka and yesterday took time to visit the incarcerated United Peoples Progressive Party – UPP president Saviour Chishimba at Woodlands police station where he is detained and charged with a fake charge of defaming Edgar Lungu. And after visiting Dr. Chishimba, Chieftainess Mumbi Mukulu expressed disgust at the dictatorial tendencies being exhibited by Lungu. The traditional leader said that not even chiefs who are usually entitled to authoritarian leadership behave in the manner Lungu is doing. And Dr. Chishimba is expected to spend the long Farmers’ day holiday which ends on Monday as he was denied police bond yesterday in spite of meeting all conditions as early as 11:00hrs. This is typical dictatorship type of harassment Lungu has adopted of picking up his opponents and locking them up. Meanwhile information obtained from Woodlands police station is that Lungu through his notorious thug home affairs minister Stephen Kampyongo has directed police at Woodlands to detain whoever visits Dr. Chishimba as co accused to the charge. 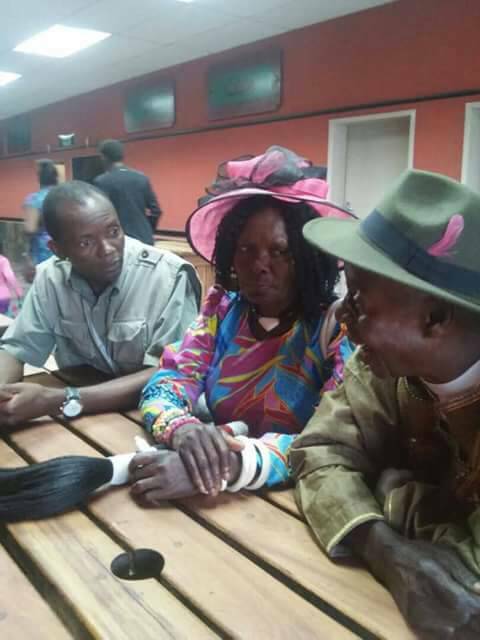 Kampyongo has issued instructions that even traditional leader be detained if she visits Dr. Chishimba again. After chief Mukuni of the Toka Leya people of Southern province condemned the inhumane and unjust treatment of UPND president Hakainde Hichilema, Lungu unleashed his Kampyongo on the traditional leader and threatened to arrest him, accusing him of being behind the PF instigated fires. How come some people can’t see dictatorship in Lungu?